The sludge, which has been coagulated with the help of a polymer, is continuously transported to the screw press. The coagulation can be easily controlled, which makes ideal dewatering conditions possible. Different sizes allow capacities of up to 1,000 kg of dry substance per hour. The ideal adaption of the screw’s geometry to the requirements of the coagulated wastewater sludge leads to a dewatering result that equals that of an advanced centrifuge system. The system, which consists of a slowly rotating screw (rotational speed 0.5-1.5 rpm) and a perforated case, guarantees low maintenance costs. The dewatered sludge cake is continuously pushed out of the screw press. 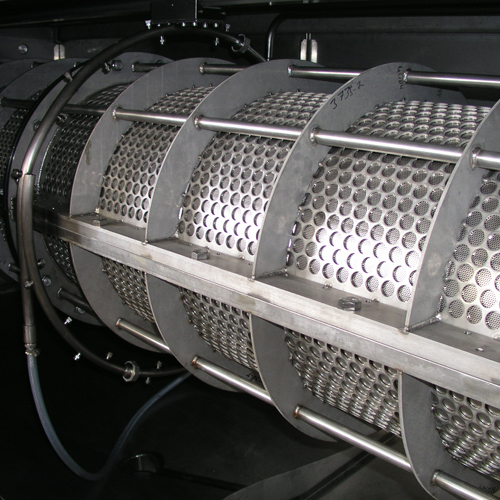 The perforated casing can be easily cleaned thanks to the fully automated washing unit with its moveable ring of washing nozzles. The economical use of the precious resource that water is makes the screw press so environmentally friendly. Thanks to its low rotational speed and the resulting high torque the screw press can be paused at any moment and can immediately continue operating without having to be rinsed. The adjustable rotational speed of the screw of 15 to 100 Hz makes it possible to operate the system at a very low speed. Thus, even higher capacities of dry matter can be reached. The screw press’ only wear part is the seal between the screen basket and the screw flanks. The seal can be replaced by opening the screen basket (multiple divisions) without having to disassemble the screw.